Department of Defense to manufacture the M9 Road Wheel. challenging made-to-spec applications. Click here! Sunray produces custom polyurethane coated ball bearings. We also have a variety of stock options. 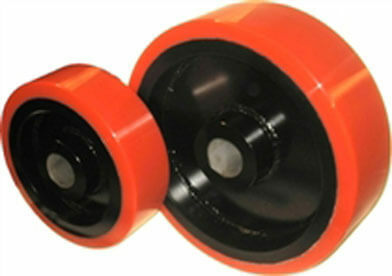 Sunray produces made-to-spec Idler Wheels. Click here for info. Click here for stock options. Sunray is capable of manufacturing many different styles of drive rollers and idler rollers, including: concave rollers, convex rollers, hubbed rollers, straight rollers, v-groove rollers, and more. Sunray specializes in producing custom polyurethane parts quickly and affordably. Sunray’s custom parts are made from the highest quality polyurethanes and are precisely molded to your exact specifications. In addition to stock bearings, Sunray can manufacture custom covered bearings based on your own design. Custom covered bearings can be produced with either flush or extended sidewalls and are able to be shipped quickly. where the finest quality polyurethane products are manufactured to your precise specifications. We specialize in providing industry-leading solutions to meet your most challenging problems, and we back this capability with outstanding customer service and competitive pricing. Sunray seeks to surpass customer expectations with the performance of our polyurethane products and services. As you visit our site, note that urethane and polyurethane are used interchangeably throughout our website. While the number of urethane compounds we produce is virtually limitless, we are experts at finding the perfect cast polyurethane formula for your specific application. And with our CNC Lathe and CNC Milling capabilities, we provide an optimal solution, one expertly crafted and conceived to meet your specific objectives. In fact, our product forms enable you to design specific urethane castings, such as urethane wheels, urethane rollers, pipe rollers, v groove wheels, dunnage, flanged wheels, and heavy duty casters. We provide solutions quickly and efficiently. Our recovering service is a great way to reduce cost. We can refurbish your existing cores in about half the time. Your product will be better than new as you help with keeping your company green by recycling. Visit our online store for high quality tailor-made urethane products built to perform and last. Shop online for casters, heavy duty wheels, ball bearings, polyurethane sheets, polyurethane rods, polyurethane tubing, covered bearings, and many more. We offer technical support that is second to none. We can perform chemical analysis, and predict theoretical life of a wheel or roll. We can also supply the load capacity based on material choice, and predict coefficient of friction. Thank you for visiting Sunray! We look forward to meeting your needs for polyurethane products, and services.